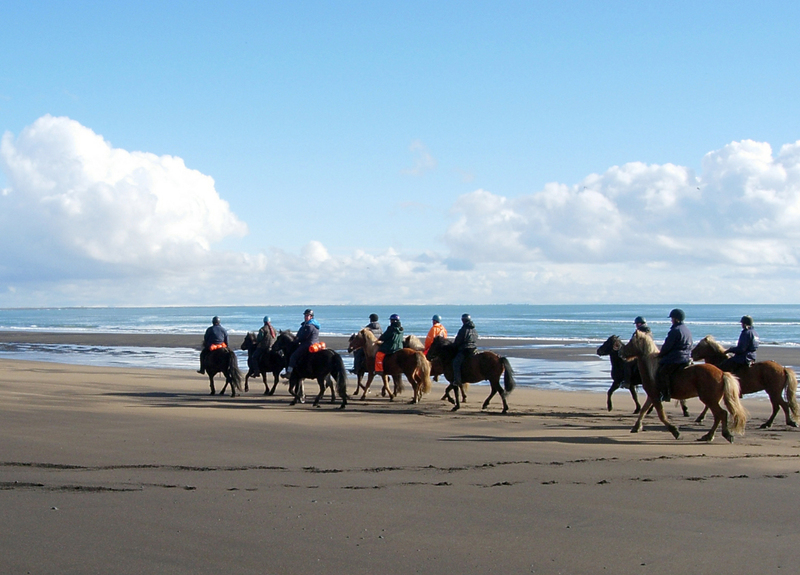 Experience the extraordinary, the volcanic beach, the river banks and islands of the Ölfusá delta and great views! 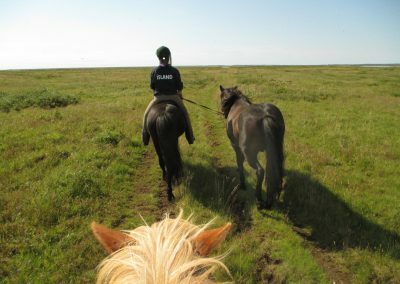 We take the horses in the trailer to the small fishing town Thorlákshöfn where we start the tour with a ride on the long, black beach. We follow the scenic beach along the surf of the North Atlantic for a few kilometers, riding on soft black lava sand until we reach the beautiful area where the mighty glacial river Ölfusá meets the sea in a large delta. 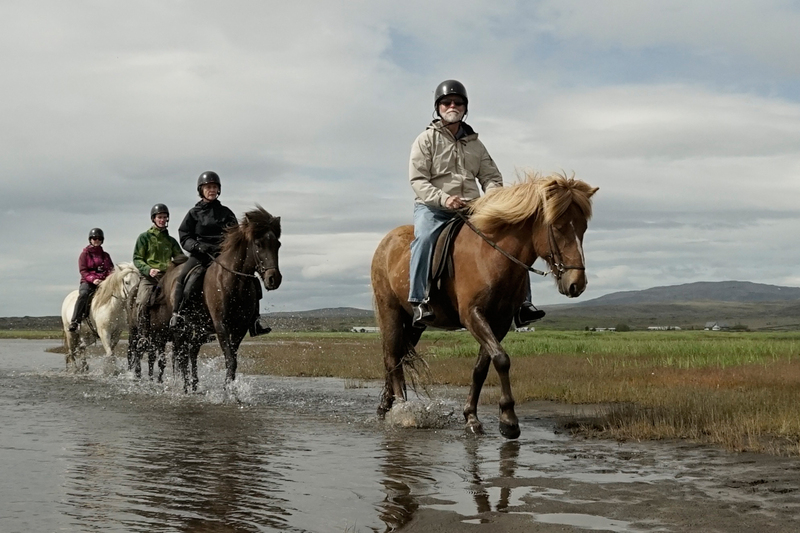 We then continue through shallow water at the edge of the river delta and ride on grassy river banks, along wetlands and meadows towards the farmland in the Ölfus area, where our farm Vellir is located. 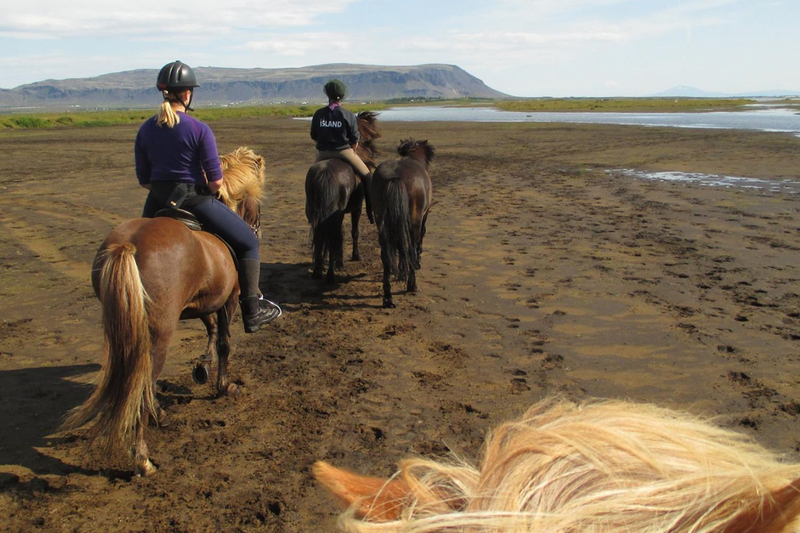 On our way we have plenty of opportunity to try the smooth gait of the Icelandic horse “tölt” on nice trails in beautiful scenery which seems to be far from civilization, and enjoy spectacular views of mountains and the volcanos Hekla and Eyjafjallajökull, weather permitting. We also have good chances to see sea- and wetland birds of various kinds living in the Flói Bird Reserve between the ocean shore and the river. After we have reached the old cemetery at Arnarbæli we ride along the river Gljúfurá and pastures with grazing horses back to Eldhestar. 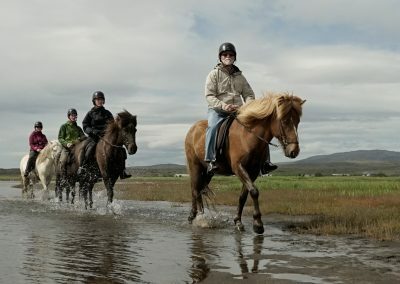 The tour can also start at Vellir and end at Thorlákshöfn, depending on tides. 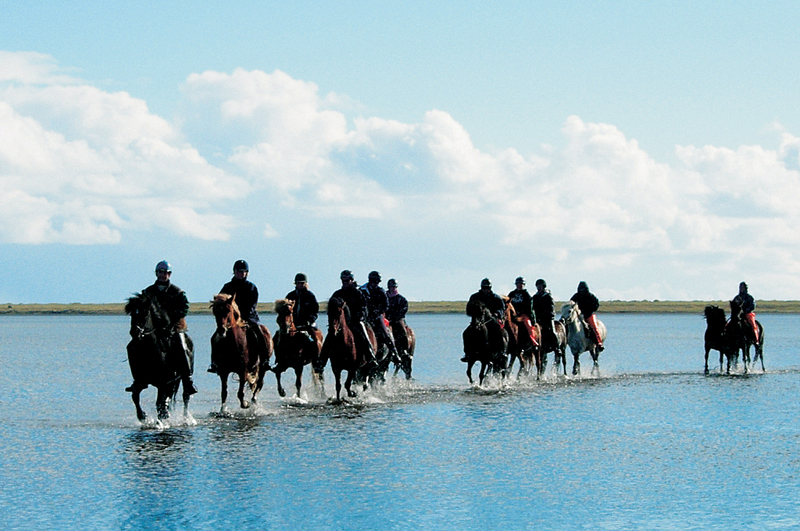 During the tour you will take a break on a scenic spot to enjoy a light lunch out in nature. 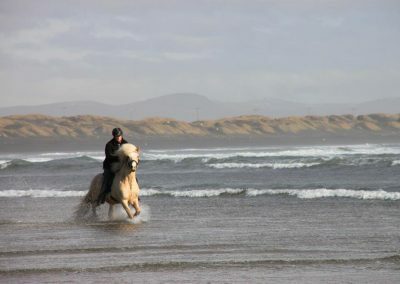 Myself and my husband booked the beach ride. 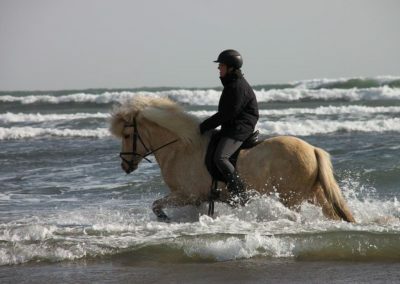 I am an experienced rider and my husband an occasional rider. 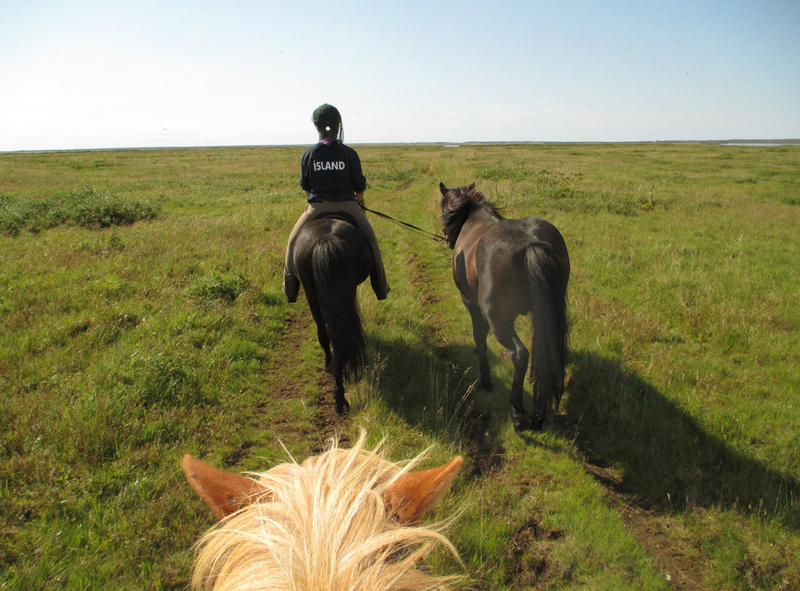 We were given horses appropriate to our abilities and both of us rode 2 horses during the day. The ride was a mix of walking and plenty of tolting, with 3 rests incorporated into the day for the horses to graze and for us to have lunch. 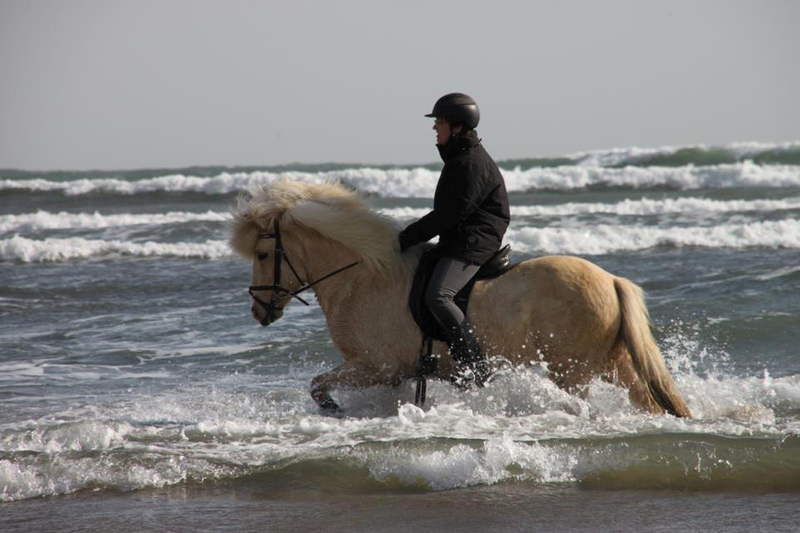 . . We then rode along the beach, across rivers and through meadows back to the farm. 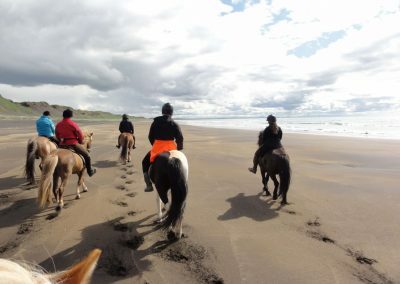 The horses were forward going, very well behaved and good-natured, all looked well cared for and happy. Our guides Leah and Daniel, we’re both very friendly and helpful and nothing was too much trouble for them. I would highly recommend Eld Hestar for riding. Daily at 9:00. Hotel pick-up in Reykjavík at 08:00 – 8:30. Pick-up in Hafnafjörður, Mosfellsbær and Kópavogur starts at 07:45. Return to Reykjavík at around 17:15. 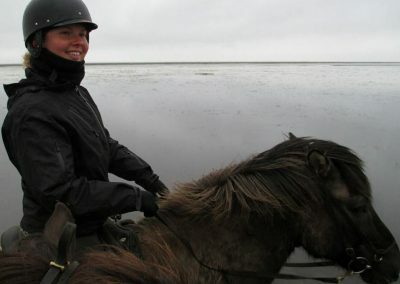 English speaking guide, riding and safety equipment and hotel pick-up. 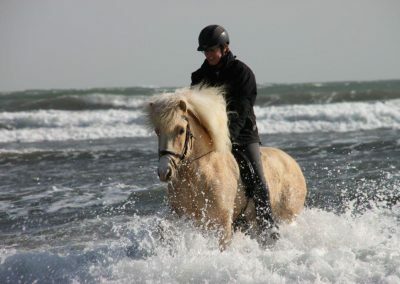 4.5 – 5.5 hours riding with stops (ca. 23 km), and lunchbox (sandwich, cookies, water bottle, special sandwiches available on request). Coffee/tea/hot chocolate and home baked cake after the tour. 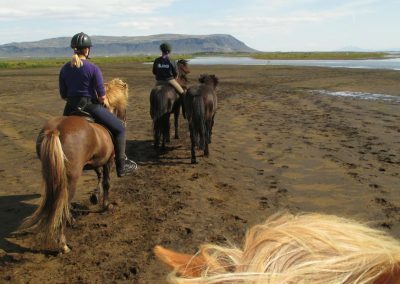 This tour is for everyone but participants should be in good physical condition and must be able to mount a horse with little assistance. 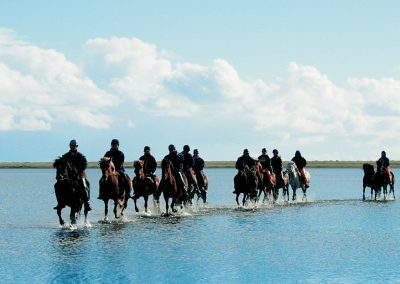 We ride through different terrain, including water in the river-delta, and cover long distances in “tölt” (comfortable gait of the Icelandic horse, about trot speed). 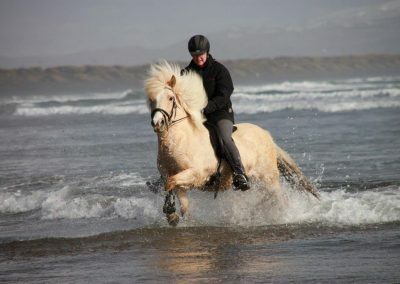 The minimum age for children is 10 years, children 14 years and younger are required to have riding skills (riding regularly for at least one year). The tour is subject to weather conditions and might be changed. Eldhestar half-day, day tours and combo tours All rates quoted are based on current purchasing price in Iceland. 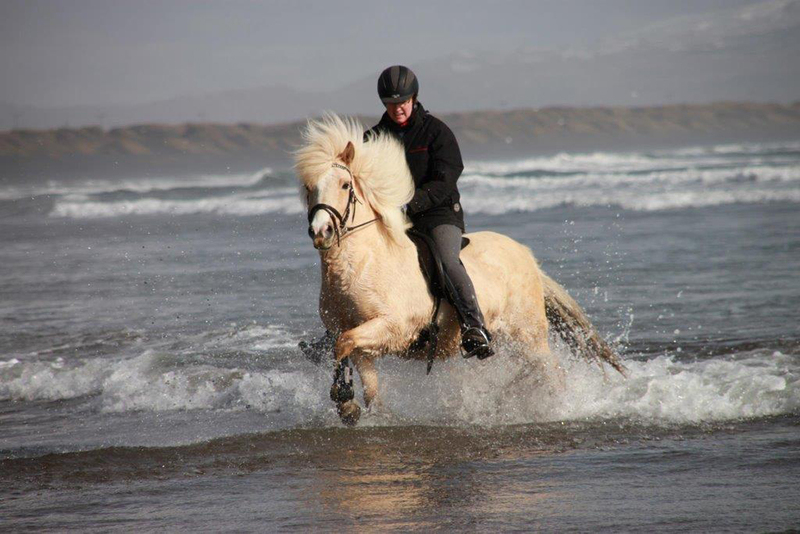 Prices are in ISK (Icelandic Kronur) Prices are guaranteed after full payment has been made. Cancellation received more than 24 hours prior to departure are fully refunded. Cancellation received less than 24 hours prior to departure will be charged full price. We advise all our clients to have travel insurance. 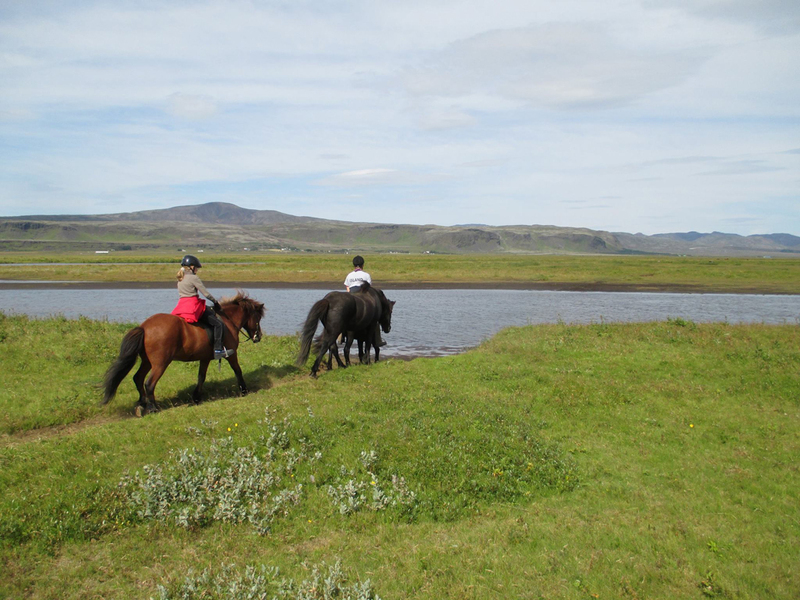 All complaints must reach Eldhestar within 5 days from departure from Iceland. Otherwise, possible compensation is not valid. 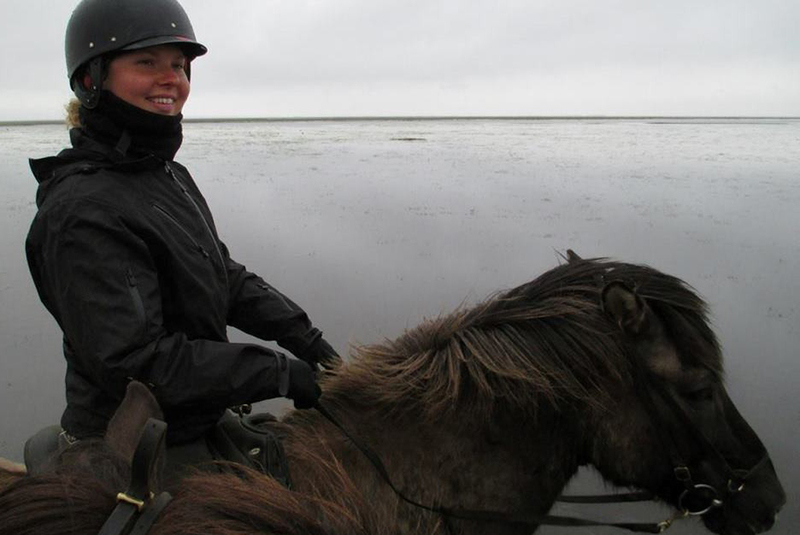 Eldhestar reserve the right to alter tours and itineraries due to weather or road conditions. All programs can be changed or cancelled at any moment during the trip to assure the safety of the clients and staff of Eldhestar and other business partners in case of combo tours. No responsibility is accepted for losses, expenses due to delays, changes of flights, or other services or because of strikes, accidents, sickness, damage, negligence, weather, war, changes in schedules, or other similar causes. Eldhestar and other partners in case of combo tours do not assume responsibility for accidents or death that can be traced to the participant´s negligence, acts of third parties or exterior circumstances such as weather, natural occurrences, war or other similar causes.